Apple Inc. shipped 3.6 million wearables in the second quarter of 2015, according to analyst firm IDC. In putting a number on Apple Watch shipments, the sole Apple product in this category, IDC is doing something that Apple hasn’t been willing to as of yet. Eyes will be on Apple during its Sept. 9 event to see if it further corroborates the numbers, but with the event’s focus the launch of the next iPhone models there is no guarantee of a clear answer. During an earnings report call in July, Apple wouldn’t come out and put a number on sales of its debut wearable product. It said that sales “exceeded expectations” but grouped the Watch in with “other products” in its earnings sheet, paired with Apple TV, Beats Electronics, iPods, and other accessories. While that category did see an earnings spike of $950 million compared to the previous quarter that seemed to be attributable to the Watch, nothing definitive was offered. According to IDC, Apple Watch sales put the company second only to the established wearables leader, FitBit, which shipped 4.4 million units. It was followed by Xiaomi, Garmin, and Samsung. If IDC’s counts are correct, then sales of the Apple Watch are on par with the 3-4 million that many analysts were projecting. Whether the Apple Watch is adopted en masse or not could be an indicator as to whether the smart watch industry is going to be as large as the smartphone market. 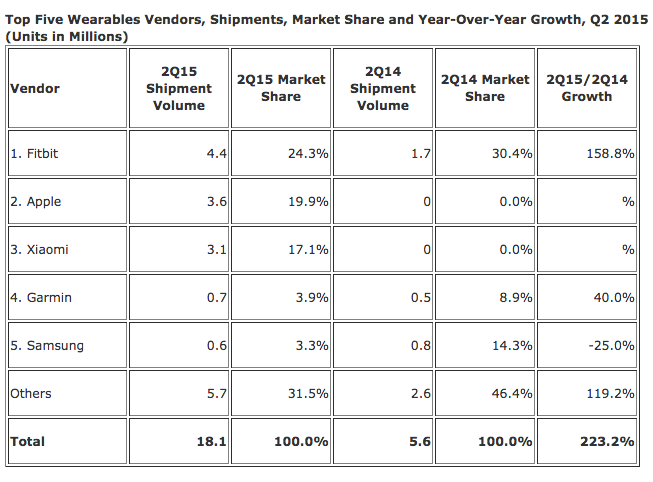 Compared to the smart watch sales of its competitors, Apple’s wearable is in another league. There were 720,000 Android Wear devices sold from various manufacturers in 2014, according to analyst firm Canalys. Other niche players like Pebble and its smart watch have done well in terms of standards for Kickstarter campaigns, recently raising more than $20 million for its Pebble Time smart watch, but just don’t have the market reach to compete with giants like Apple.